Riding on better-than-expected macro data and further recovery in the rupee, benchmark Sensex spurted around 373 points on Friday to reclaim the 38,000-mark. The benchmark BSE Sensex stayed in the positive terrain through the session and touched a high of 38,125.62. It finally settled 372.68 points, or 0.99 per cent higher at 38,090.64 -- its highest closing since September 7 when it had finished at 38,389.82. The gauge had zoomed 304.83 points on Wednesday. However, the indices closed with losses for the second straight week. 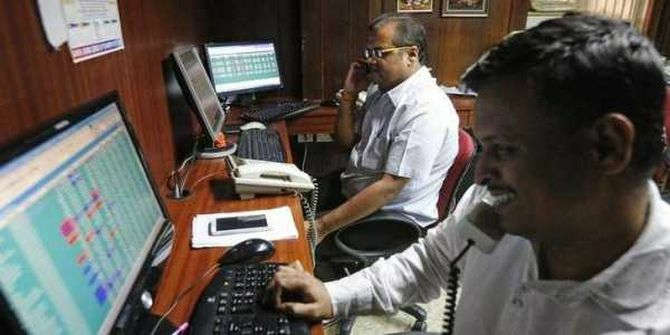 The Sensex lost some 300 points, or 0.77 per cent, while the NSE Nifty fell 73.90 points, or 0.64 per cent, during the week. Domestic sentiments were upbeat on positive macro data which were announced after trading hours Wednesday coupled with a firming trend at other Asian bourses. Industrial production (IIP) grew at 6.6 per cent in July, while retail inflation cooled to a 10-month low of 3.69 per cent in August. Meanwhile, WPI inflation also eased to a four-month low of 4.53 per cent in August on softening of prices of food articles, especially vegetables. Meanwhile, domestic institutional investors (DIIs) remained net buyers, picking up shares worth Rs 541.44 crore on Wednesday. However, foreign portfolio investors (FPIs) sold equities to the tune of Rs 1,086.39 crore, provisional data showed. Was Rs 42,200-cr worth dirty money deposited in Jan-Dhan A/Cs?